OODBRIDGE, Va., April 25 — A chilly dawn is breaking over the Horner Road commuter parking lot in Woodbridge, 25 miles south of Washington, D.C. A woman in a white Mercedes pulls up to the front of the line of people dressed for office work. "Pentagon?" she asks a bald man in a somber suit. "Yes, ma'am," he tells her, climbing aboard. "Pentagon?" she asks the next in line, a man with a book. And then they are off, whipping 60 and 70 miles an hour up Interstate 95 in the H.O.V. lanes, passing drivers crawling in the regular lanes that make I-95 and I-395 to Washington among the most enervating, most crash-prone, most congested rush-hour arteries in the nation. They will be at work in half an hour, as little as a quarter of the time that each would have spent driving alone. This form of commuting — solo drivers picking up strangers so they can all cruise to work legally in high-occupancy-vehicle lanes — is called "slugging." Passengers are "slugs," a label alluding not to their energy or wit but to counterfeit tokens and coins. A ride, too, is a slug. Drivers are drivers, or less commonly, "body snatchers," "scrapers" and "land sharks." With little notice outside Washington, these Northern Virginia commuters to the nation's capital and big office sites of nearby Arlington, Rosslyn and Crystal City have blended hitchhiking and carpooling into a quick, efficient way to outmaneuver a traffic-choked freeway. Slugging started by spontaneous eruption and runs by perpetual motion. When the area's three-person, high-occupancy vehicle lanes opened 30 years ago, some guy and then another and another picked up commuters at bus stops to get the passengers needed to use the lanes. No government agency sanctions slugging, runs it, regulates it, promotes it or thought it up. The Census Bureau, which tracks most forms of commuting, knows nothing about slugging. In slugging, there is no supervisor, dispatcher or schedule, no ticket or fare. No think tank has analyzed it, although one slug, Lt. Col. David LeBlanc of the Army, has written a how-to book, "Slugging," which he published himself, and he operates one of two local slugging Web sites. But organized oversight stops there. "When you get in the car, you don't converse with the driver," said David Howe, 41, a slug who works as a security manager for the Defense Department. "Only the driver can initiate a conversation. You're basically a body in the car. You're not to talk on a cellphone or with other people in the car." Slugs must not smoke, eat, fiddle with the radio, windows or air-conditioning or, if they are invited to talk, say anything at all about religion or politics, Mr. Howe said. About 10,000 commuters in Northern Virginia — no one keeps an exact count — go to and from work this way. In a study four years ago, the Virginia Department of Transportation spotted slugs aboard one in four cars traveling the H.O.V. lanes during the 6-to-9 a.m., three-rider restricted period. Since then the number of sites for them to park and line up off I-95 and in Washington, especially along 14th Street, where slugs stand to go home, has grown. The Virginia Department of Transportation, which operates 12 commuter lots just off I-95 that are used mostly by slugs, has expanded the parking places to 7,934, all free of charge, from 4,205 in 1995. Most were added in the last two years. Privately owned sites, mostly in malls, account for at least 2,000 additional free spaces. Many lots fill up by 7:30, so slugs' cars line roads into the lots. "I live about three miles from here," in a large planned community called Montclair, said Mr. Howe as he walked into the 360-car Dumfries Road lot, just east of I-95's Exit 152. It was 7:40 a.m. and the lot was already full, so he parked with a long line of other cars on an adjacent road. 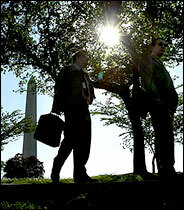 No slug line remained, and as he waited — just five minutes for a ride to the Pentagon — Mr. Howe explained the system. In the lots, a driver at the head of the car line pulls up to the "head slug" in the front of the commuter line. He flashes an 8-by-10 card showing one of the line's regular destinations, like the Pentagon, the State Department, or 14th and Constitution downtown, or calls it out. If that is the head slug's destination, he gets in the car. If, instead, the head slug is going to Rosslyn, the driver must take the next in line going to the Pentagon. A driver who spots a friend down the line may offer him a ride, and a slug can take another car if he is suspicious of the driver of the first. In practice, it is first come first served. At the end of the day, "slugs" heading for Northern Virginia line up along 14th Street to wait for a ride. "Generally, it's safe because you have one driver picking up two strangers," said Jenny Cameron, 26, who was in line for a ride from the Horner Road site here to her job downtown at the World Wildlife Fund. "I slug because I can't afford the parking downtown," Ms. Cameron said. "It costs $7 in my building." She said: "I have turned down rides where two men were in the front seat. In general, I've never been scared. Only once in a while do you get a bad driver. The worst thing was getting in a car and finding somebody was smoking. More often you hear about nice stuff like drivers' picking up slugs when other drivers' cars have broken down." Tracy Rutherford, 41, a college admissions officer in Crystal City who has been hauling slugs for six years, explains what happens when a cellphone rings: "I just ask them to keep it short. We all have to check in sometimes. There's never a hassle because we need each other. They need me. I need them." Linda Cockrell, a screening manager at Reagan National Airport, pulled up in a green Jeep. "What I do is take the H.O.V. and the Pentagon exit off 395 and drop people off" approaching the airport, said Ms. Cockrell, who lives in Manassas. Without slugs aboard, she said, "it takes me over two hours to drive it. With this it's less than 30 minutes." No government agencies, slugging Web sites or slugs and drivers interviewed could cite a single instance of crime and slugging. "I have never heard of any crime, any foul play, anything," Mr. Howe said. "The only thing that happened to me that was adverse, I got in a car at the Pentagon, and the guy ran out of gas." The driver called for assistance, and Mr. Howe called a friend for a ride back to his lot. Lately, transportation analysts say, experiments in slugging have begun in Houston, San Francisco and Seattle, and in many more cities, commuters turn to carpooling and other forms of sharing rides. But in the numbers of people involved, "nothing else like this has developed as it has in D.C.," David Schrank, a researcher at the Texas Transportation Institute, said. "Slugging's developed into its own lifestyle there," he said. His institute, which monitors the nation's shifting travel patterns, ranks Washington's congestion the third worst, after Los Angeles and San Francisco. Evenings, as waves of slugs spill out of offices downtown to catch rides back to the lots like Horner Road, lines can stretch to 30 or 40 and waits to 10 minutes. But mornings this week at Horner Road, lines flowed without stop and stretched to no more than 10 passengers or cars and to waits of no more than a minute or two. Horner Road takes 2,267 cars, nearly all slugs. There, said Valerie Pardo, a senior transportation engineer at the Virginia Department of Transportation, "we've had to add spaces and add spaces and add spaces." She said: "Sluggers are a very important part of the success of our H.O.V. lanes. We've got 25,000 cars using them every day, and sluggers are a big part of that." Other than paving lots and putting up Plexiglas shelters for the slug lines and buses, slugging is strictly laissez faire. "We try to stay out it," Ms. Prado said. The state does not openly promote slugging, she said, in part because the state could become liable for accidents or crime in the lots. Slugging is working and growing, Phil Salopek, a demographer at the Census Bureau speculates, because it responds to measures employers have been taking to fight traffic congestion. Unlike carpooling, which declined in the 1990's, it accommodates workers' flexible and alternative work schedules. "Slugging lets you do that," he said. "Slugging may work for you, too." San Francisco area residents aren't just now experimenting in ride sharing; it's been going on here for about 20 years. We don't call it "slugging," just "casual car-pooling," but the informal rules and behaviors are the same. Regarding the radio station issue, most riders and drivers here seem to favor National Public Radio. But every now and then, there is a bad lapse in etiquette from a driver: you get into a car and find yourself subjected to 30 minutes of the worst easy listening radio. That's when you look longingly over at the single drivers stuck in traffic. As a Berkeley, Calif., resident in the late 80's, I enjoyed free daily rides to work in San Francisco from East Bay drivers wishing to escape the Bay Bridge toll and gain entry to its car pool lane. Back then, we called it "yuppie hitchhiking," and true to form, those waiting for lifts near the freeway on-ramps tended to fret most about the possibility of being chauffered to work in a Pinto rather than a Mercedes.